Commelina – After Dutch 17th century botanists Johan and Caspar Commelin. Scurvy Weed: Used by early European settlers to avoid or treat scurvy. 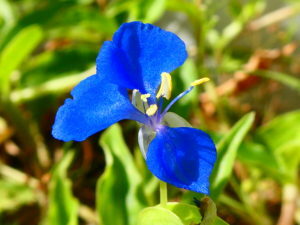 Looks similar to Tradescantia fluminensis when not in flower. Native plant that can be weedy in gardens and smother other plants. The blue flowers attracts native bees. Grows rapidly in warm, wet weather. Range: NSW coast, ranges and Queensland. Found in The Hills Shire, generally in damper areas.